An enouncement (from French l’énoncé, meaning "the statement") is not a unit of semiotic signs, but an abstract construct that allows the signs to assign and communicate specific, repeatable relations to, between, and among objects, subjects, and statements. Hence, a discourse is composed of semiotic sequences (relations among signs) between and among objects, subjects, and statements. 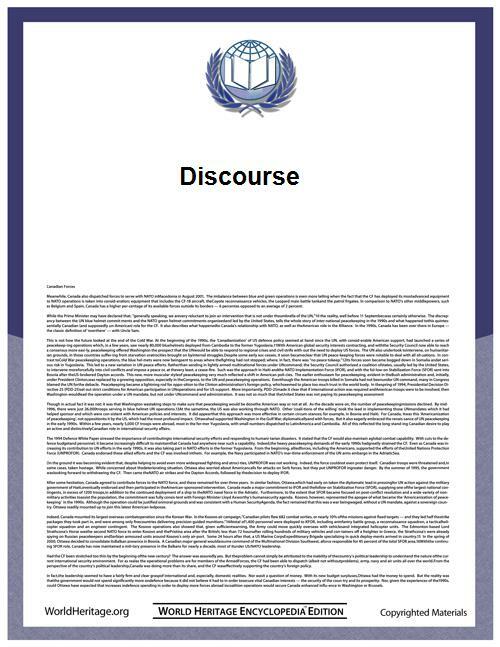 The term discursive formation conceptually describes the regular communications (written and spoken) that produce such discourses. As a philosopher, Foucault applied the discursive formation in the analyses of large bodies of knowledge, such as political economy and natural history. ^ . revue-texto.net. June 2001. ^ I. Lessa (2006). "Discursive struggles within social welfare: Restaging teen motherhood". J. Motion & S. Leitch (2007). "A toolbox for public relations: The oeuvre of Michel Foucault".